Full kitchens an outdoor pool and free Wi-Fi and breakfast help create a home-away-from-home feel at the non-smoking Towneplace Suites Aiken Whiskey Road. All 85 rooms at the four-story Towneplace Suites keep guests comfortable with full kitchens free Wi-Fi and cable TV. Each morning's continental breakfast buffet is complimentary. During the summer months enjoy the seasonal outdoor pool. Year-round perks include access to fitness and business facilities. Parking is free. 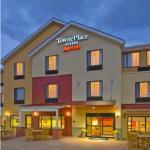 The Towneplace Suites is in Aiken 22 miles northeast of Augusta and nine miles south of I-20. It's less than two miles from Palmetto Golf Club which is open to the public during Masters Week each April. The Thoroughbred Racing Hall of Fame is two miles away and Carolina Bay Nature Preserve is one mile from the hotel. Augusta Regional Airport is 26 miles southwest.